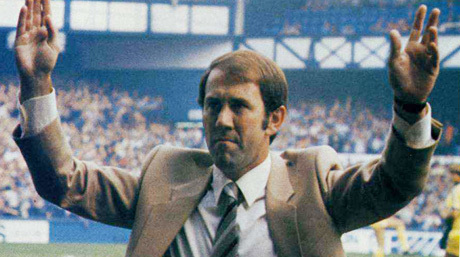 Does Howard Kendall deserve a statue outside of Goodison Park? Here on St Domingo’s, there is a regular column devoted to recognising the excellence of the 1980’s, so to keep in theme with that, I would like to focus on the man who orchestrated it all. The word ‘legend’ sometimes gets used too casually these days, but in the case of Howard Kendall, nothing could be more appropriate. If you were to walk along Goodison Road or Gwladys Street on a match day, and ask any fan to name three key elements of Everton’s history, chances are that the most common responses would include Dixie Dean, the Holy Trinity and the 1980s. Dixie Dean is already honoured with his own statue outside the Park End, and with regards to the other two aforementioned suggestions, it is fair to say Howard Kendall was heavily involved in making them both so important to Everton fans. His record speaks for itself really. As a manager, Kendall currently goes down as the most successful man to take charge at Goodison, with his haul of 2 League Championships, 1 FA Cup and 1 European Cup Winners Cup yet to be bettered. Many generations of Everton fans widely regard the 80’s as the club’s finest moment and the glory days of that decade live long in the memory. However, Kendall is also revered as a player, being a key member of the title-winning side of 1969/70 season. Kendall played an important role in securing the League that year, making up one part of the ‘Holy Trinity’, along with Colin Harvey and Alan Ball, and this midfield triple is something else that Evertonians hold close to their hearts. So as Kendall has played such a pivotal part in the development of Everton’s rich history, it begs the question, should he, like Dixie Dean, have his own statue outside of Goodison Park? Of course, as well as the great memories that are stirred with the mention of Kendall’s name, there are also the darker ones that spring to mind. The big question of ‘What If?’ haunts Evertonians when thinking of Kendall’s reign, with regards the European Ban, which eventually culminated in the disintegration of the team and Kendall leaving to test himself on the European Stage. Evidently Kendall’s ambition proved to influence in his decision to leave Goodison Park for Athletic Bilbao, but fans were not overly begrudging at his choice. However, the issue of Kendall’s next two managerial reigns is something that has sadly tarnished his reputation amongst some supporters. The early 90’s rule under Kendall proved to be a massive disappointment as Evertonians watched the side decline rapidly, but what has really polarised fans was the calamitous season of 1997/8. All Everton fans remember that truly horrific season, so it is not worth delving too far into it, but the question has to be asked, do the bad spells really outweigh the great times under Kendall? What can at least be drawn from the second and third times round was that he continued to return to a club he loved in their time of need. In fact in Howard’s own books, he has regularly reflected on his passion for the club and how much it meant to him to play for and manage Everton. No Everton fan can deny that Kendall has shown an incredible amount of devotion to Everton over the years and I would argue that the club should now reward him with a statue to truly immortalise himself outside of Goodison Park. In fairness, the club did honour him with a testimonial game against Athletic Bilbao on Sat 12th August 2006, but Everton duly lost the game 0-1 and Kendall is deserving of better. Looking from the outside, it has seemed over the recent years that the club distanced itself from Howard Kendall and it was commented in some areas that previous manager David Moyes never really welcomed Kendall or embraced his history with the club. In Roberto Martinez’s short time at the club he has already seemingly gone out of his way to recognise Howard’s achievements and champion his efforts. As was well reported in the media, Martinez invited Kendall to Finch Farm, in a move that was warmly received by Kendall and fans alike. The attitude of Martinez seems to represent a shift from the club as a whole, who now seem proud to remember the great times of the past. Obviously there a number of great names in Everton’s past who deserve decorating, and just looking at the list of the Everton Giants you could probably make a case for putting a statue of each one of them outside the ground. But in the case of Kendall, he is particularly special as a player and manager and it would make a real statement to honour him with a statue in my opinion. Come on Everton, make it happen. Do you, the reader, agree? Or is this all just too sentimental? My 8 year old son’s middle name is Kendall. He’ll always personify the club motto, and will always be truly ingrained in Everton. Why not a statue of the Holy Trinity? Manchester United have their Law, Best and Charlton one and I think such a memorial would look good outside Goodison.